Layer the sausage links onto a baking sheet and bake for 25 minutes, or until done. Cut in half length-wise, then cut at an angle into 1/2 inch slices. Remove bacon and crumble. Set aside. Add garlic to the onions and cook an additional 1 minute. Add chicken base or bouillon, water, and potatoes, simmer 15 minutes. 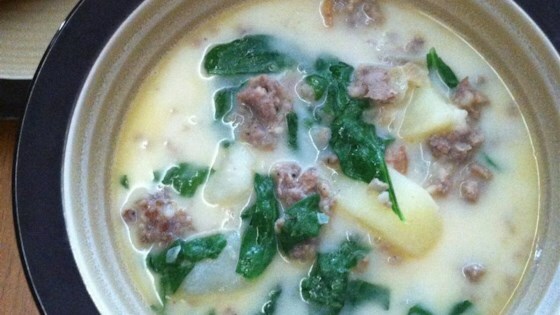 See how to make a healthy Tuscan-style soup. Only reason this did not make 5 stars is because it was too salty...I will try again and adjust. But it was sooo yummy other than that.